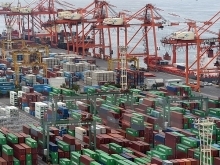 Senior officials from 16 Asia-Pacific countries met in Kobe, Japan on February 27 for the next round of negotiations on the Regional Comprehensive Economic Partnership (RCEP). The RCEP member nations include the 10 ASEAN member nations and six dialogue partners, namely China, India, Japan, the Republic of Korea, Australia, and New Zealand. This is the first round of RCEP negotiations since President Donald Trump pulled the US out of the Trans-Pacific Partnership. Delegates are discussing tariffs in the new economic zone and how advanced countries will assist emerging economies, common rules on investment and e-commerce. Iman Pambagyo, director general of international trade negotiations at Indonesia’s Trade Ministry and chair of the meeting, said the talks on the RCEP are key to establishing regional free trade agreements and contributing to promoting global trade. RCEP negotiations kicked off in 2012. The members are estimated to account for 29 percent of the global trade, or 9.5 trillion USD. In the framework of RCEP, the members hope to eliminate 80 percent of tariffs. The rate will be 92 percent among ASEAN nations. After 16 rounds of negotiations, the participating countries have so far agreed on fields of economic and technological cooperation and assistance to small- and medium-sized enterprises.